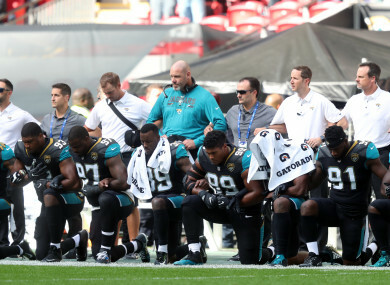 Jacksonville Jaguars players kneel in protest during the national anthem. AS THE DEBATE rages over protests during the national anthem before NFL games, Commissioner Roger Goodell now says the league has a plan to end the protests and unify the league. ESPN’s Adam Schefter has obtained a letter sent to all 32 teams in which Goodell says the league needs to “move past this controversy” but also hints at a plan to address the concerns being raised by players and help give them a bigger voice in addressing social issues outside the NFL. Goodell goes on to write that the league has developed a plan it will share with the players during next week’s league meeting. Email “Roger Goodell letter to teams and players says NFL has a plan to end anthem protests”. Feedback on “Roger Goodell letter to teams and players says NFL has a plan to end anthem protests”.